This this our third in a series of posts of photos and information from the Harper family, courtesy of Tom Harper, showing the family’s involvement in racing (on the 4th generation today). 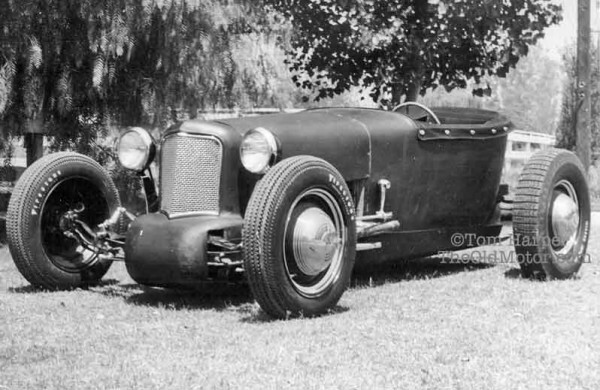 After WWII, Tom Harper’s father Ben Harper Jr. and his brother Stu (seen above) built the dry lakes roadster powered by a Ford flathead V-8. The photo shows the car in line with Stu ready to make a run at Muroc Dry Lake in 1947, where the car was timed at about 120 mph. All in all, fairly impressive for a car the brothers built in their driveway. After running the car at Muroc the pair added a grille and lamps, beauty rings, hubcaps and a tonneau cover and drove it on the streets of Southern, CA. as seen (above). Harper does not know what ended up happening to the car and we would like to know if anyone knows more about its history and if it has survived. We have seen photos of the car recently, so there must be some knowledge of it out there in motor land. To learn more about dry lakes racing, you can read a good review of The Birth of Hot Rodding and also see many good colored photos featured in the book. 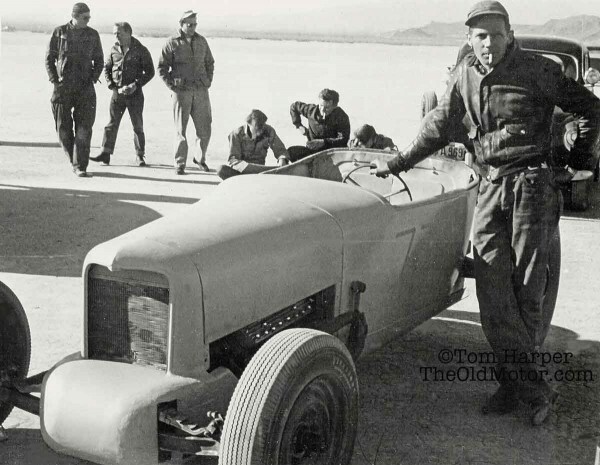 We also have an excellent 8 mm film by Tommy Lorbeer, with very rare footage prewar posted here on The Old Motor, of racing at the Harper dry lake in California during 1940. Just (above) is a very good period film by Evans Speed Equipment and the Southern California Timing Association (SCTA) Road Runners, from about the same time period. It shows many cars running at El Mirage Dry Lake including our hero Mel (Melvin Potts) and also includes a corny Hollywood ending. You can also take a look back at our posts here about the father, Ben Harper racing in the late teens and 1920s. This entry was posted in Auto Racing 1946 - 1965, Uncategorized, video and tagged Ben and Stu Harpers Lakester, El Mirage Dry Lake races, Evans Speed Equipment, Ford flathead V-8, Muroc Lake 1947, Southern California Timing Association (SCTA) Road Runners, The Birth of Hot Rodding.